Roskilde Festival is one of the most famous festivals in the world. It's a cult festival, everyone goes there just because it's "Roskilde". And I'll agree, it's really awesome even without all the bands. 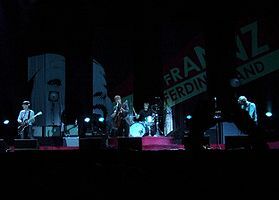 But most of the time there are some 'good' bands playing as well, such as Franz Ferdinand. They started playing around 18:00 on the arena stage which could hold about 10-15 thousand people watching. It wasn't even nearly full, I think we had maximum 7000 people if even that. I was unlucky to come a little bit too late (10 minutes before the concert began) so I was unable to get anywhere near the stage. I was about 80 metres from the stage, all the way on the far left which meant that I couldn't see the band properly. Luckily the had big screens but that was sort of boring. Honestly, I expected a lot from this concert. I love Take Me Out and The Dark Of The Matinee, and I was expecting the rest of the songs to be as good. I was deeply disappointed by the overall concert. I'll give it to them that once they played "Take Me Out" and "The Dark of The Matinee" the crowd was really singing along and 'exploded' into cheering. "Jacqueline" had also a little bit of this effect. But these were pretty much the only good songs. The rest of the songs all sounded the same, and even worse: looked the same. 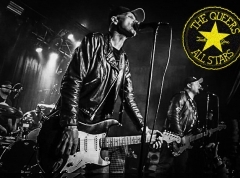 The only thing the guitarist, singer & bassist could do was to jump from front to back in a way that they kept twisting either one of their legs from around the knee-point, to either left or right side. Fair enough, this was cool and energetic for about two songs. But they did it in every single song; the exactly same move kept repeating again and again. Basically they just looked literally like Trolds - just without the trold hat. The worst part in my opinion was that all of the songs sounded exactly the same. Other than "Take Me Out", "Jacqueline", and "The Dark of The Matinee", I couldn't differentiate one song from another. The cameraman kept zooming in on the guitarist to see how he played the guitar, which could be seen on the bigscreen. I have never seen anyone play so 'similarly' throughout a whole concert. He kept ramming and ramming the chords in every single song exactly the same way, hand moving the same speed up and down the strings. There were no guitar solos, no improvisation, nothing. One thing I'll give them though: They sound exactly the same live as on the cd, so they at least know how to play their songs without editing them. One thing is for sure: I won't go see them again.